The problem with remakes is that all too often they’re not as good as the original. 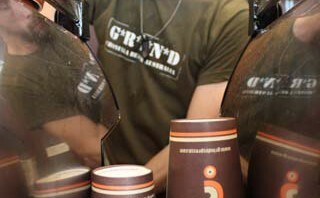 So you can understand the trepidation when Grind announced a refurbishment of their founding cafe. What would be the fate of one of Sydney’s best? The baristas are quick to point out that the renovations were more cosmetic than structural: the floorboards are newly polished, the walls are a fresher shade of cream -but aside from that (and some more kitchen space out back), the heritage building is relatively unchanged. The consistently good coffee and the staff’s passion remain in place. A cameo 20-years-aged Colombian possesses a woody aroma, dense body, mild acidity and burnt-caramel flavour -truly something to savour. The house blend is just as exciting, with buttery tones and a sweet aftertaste. Later at night, Turkish and the Japanese siphon coffees are served: think rich, deep in flavour, and smooth on the palate. All up, the Grind remake delivers a quality show -the kind you’d buy in box set. This entry was posted in testcat and tagged 5 beans, awards, Cronulla, god shot, single origin. Bookmark the permalink. I wish there was an inner-west Grind! I just can’t get to Cronulla often enough. C’mon Rich we all dont work in the Shire. Impressive dedication! Glad to see Grind move steadily onwards and upwards and have benefited rather than suffered from the refurb.